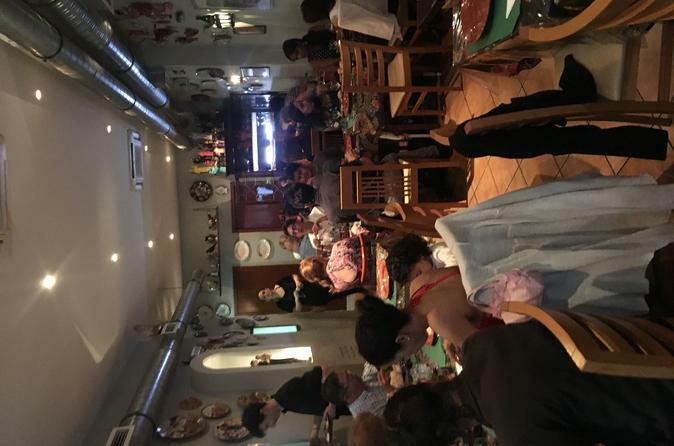 Fai un tour serale di Lisbona per ammirare i panorami della città mentre si accendono per la notte, e goditi una cena in un ristorante Fado locale, dove guarderai uno spettacolo dal vivo della musica tradizionale del Portogallo. Ascolta i suoni cupi di questa musica folk mentre cenate con piatti portoghesi, e poi guidate lungo i monumenti storici di Lisbona durante il tour della città. By far the worst excursion experience I have had on Viator! I have a feeling we experienced the old bait and switch. I have used Viator for several of my trips and have never had a bad experience until this fado dinner show. This excursion is not as advertised and the pictures are far from the truth. There is nothing glamorous and the company is extreme unprofessional and unorganized. The reviews seemed good, until July 2018, so the company must have recently changed their excursion experience SO PLEASE DO NOT BOOK THIS! We were picked up at our hotel on time, but it was my friend and I not a group - which isn't necessary a bad thing. When we arrived at the restaurant, the driver smashed into a pole when trying to park, which startled us, and then drove off quickly about a block down the street. We walked back to the area where he smashed into the pole and had us walk up hill most of the way. When we arrived for dinner and restaurant staff did not know what was included in the dinner package, so we fumbled through the ticket information to try to figure out what was included. Keep in mind, we paid roughly 70/per person for this excursion package and each plate was roughly 10 Euros and the show is open to anyone that has dinner there. Honestly, I would recommend just going to the restaurant, which is called Retiro Dos Sentido, if you want the fado experience. The restaurant is a hole in the wall, which isn't necessary a bad thing, but not worth 70. To continue with the bad review, we were seated at 7:30 pm and we were served our dinner, which was nothing special. Dinner service was about 2 hours total and then the restaurant manager told us that the guided tour would not start until 10:30 pm 3 hours after pick-up!. At that point we were already disappointed with the experience we had a negligent driver, nothing special food and then were told to wait around for another hour for the walking tour. We just walked out and tried to make the most of the night, but hitting up a rooftop bar. I would really suggest that you DO NOT BOOK THIS EXCURSION! It is not worth 70/per person. 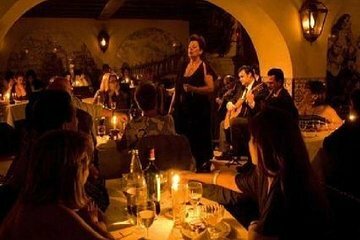 We were so looking forward to the tour as we had heard good things about Fado shows in the area we were staying Alfama and were excited when we were picked up. As the tour doesnt outline where you are going, we were not impressed to be taken to the Bairro Alto area although our guide was thrilled to tell us about how people enjoy the nightlife until after 4 am. Trying to keep an open mind we were ushered into a restaurant and provided a table in the back, even though other tables were free and more desirable. So our group of 8 was wedged between the bathrooms, kitchen and sideboard that the staff kept wiggling past us to get into the get glassware and other things needed for the tables. When our waiter arrived he had no idea we were part of a tour with dinner included. He didnt speak much English and finally noted we could order what we like but not too much so we have no idea what should have been part of our meal. We didnt pay extra so thats something but the food was nothing special and really felt like tourist food, we had sourced much better food near where we were staying. The Fado show itself was disappointing. A gentleman came out and sang 2 songs, than the main event, a lady with a lovely voice sang one. They repeated this once more and then the show was over. Our driver was back way before the food was done so the show is generally very short. He waited for us and took us on a night tour of the city...not sure how that was supposed to be but we drove up to a hill top for a view, then to a local artists street art and back to our hotel. We were very disappointed. We had met a local who took us on day tour for half that cost and was amazing all day. He was shocked when we told him about where we went as part of an expensive tour for a Fado show. My advice, skip this tour - get to Lisbon and ask around and you will find the locals will steer you somewhere awesome, authentic and ensure you have a great time. We were disappointed with this tour. There was not a special Fado Show but rather we were brought to a restaurant that had a Fado guitarist and singer who played a few songs. This show was free to anyone who walked into the restaurant. As far as the dinner, we were given menus and told we could spend 18 euro each, and anything more than that we would be responsible for. Considering the cost of the tour, I expected a much nicer dinner that would have been covered in full. Our driver did drive us around the city after dinner, but it was not a Panoramic Night Tour The description given for tour was misleading. This was a fun evening. The restaurant is small and feels authentic. Good food. The Bacalhau was divine. Our guide was great. After dinner he drove us all around the city and gave us so much information on the sites. He even bought us a pastel de nata at Antiga Confeitaria de Belém. He was wonderful! terrible service the car all dirty blood on the seat restuarante very bad. Dinner and the show was alright nothing really special. Food was ok and service was very slow. Dining room was uncomfortably hot. The guide that gave the panoramic tour gave a good description of the many parts of Lisbon pointing out. Originally we thought it's a great way to see Lisbon at night. But as it turned out we circled around the Alfama twice and that was the end of the tour. Wish we saw other vantage points. The fado show was good. The singers were very talented. We enjoyed the dinner. Was a choice of Cod cakes or pork. I got the cod. My wife got the pork. Both were very good. The waiter was excellent. It came with a bottle of white wine or red wine. We got the white. The night tour was a tour of the Graca distict. I thought it would be a little more comprehensive. I was hoping to see the Belem monuments at night, but no such luck. Our driver was really nice. The best Fado show in town. A great experience excellent meal great service and wonderful Lisbon Illumination tour after the diner and show. Not to be missed on your trip to Lisbon. Food at the restaurant was very bad. Fish dish was terrible. get good photos or videos of the entertainment.